The Michigan State men’s basketball team had high hopes for the 2019 season, but look on to next year as the projected No. 1 seed (Photograph courtesy of Andy Lyons/Getty Images/TNS). The latest chapter of the National Collegiate Athletic Association’s annual men’s basketball championship has concluded, with the University of Virginia’s Cavaliers being crowned the winners of the 2019 edition. The final saw the Cavaliers go up against the Red Raiders of Texas Tech University in a matchup few experts saw materializing at the tournament’s start. While much of the media coverage will now be surrounding the heroics of Virginia shooting guard Kyle Guy and the 17 points tallied by the Cavaliers in overtime to clinch the national title, the main talking points should be focused on the future, and the future rests resoundingly in the hands of the Michigan State University Spartans. In the immediate aftermath of the tournament, the projected national rankings for the 2019-20 college basketball season have been announced, with Michigan State topping the list at No. 1. 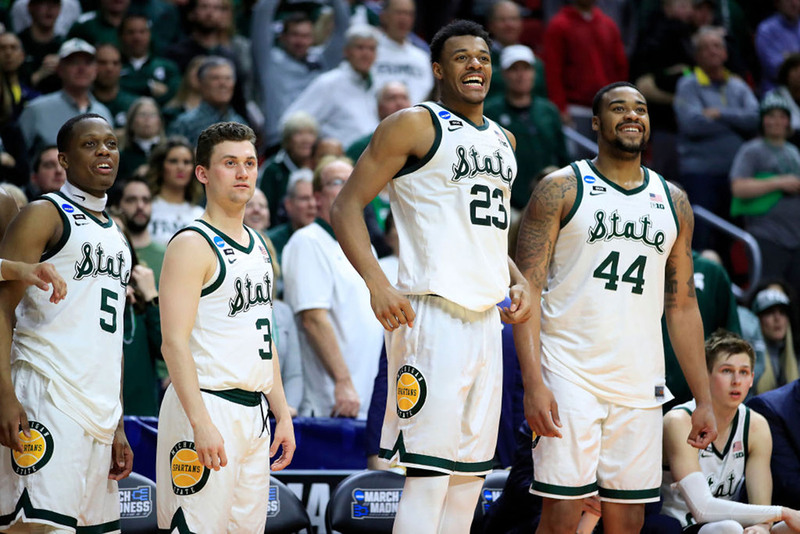 That the Spartans are ranked so highly shouldn’t be considered too much of a surprise, as they have reached the Final Four of the tournament three times during the decade, while also making an appearance in every single NCAA basketball tournament since 1998. However, their spot in the newly drawn rankings has been met with surprise and criticism from fans and pundits alike, who question the Spartans’ placement ahead of powerhouses such as Duke University, the University of North Carolina at Chapel Hill, and even the most recent champions, Virginia. To understand the favoritism being shown towards Michigan State, one has to look back to the end of the 2017-18 season, when the Spartans’ longtime head coach Tom Izzo began making the necessary moves to secure a national championship. At the end of their 2018 campaign, the Spartans had amassed an impressive 30-5 record, while managing to capture the league championship of the Big Ten Conference, considered to be one of, if not the most, competitive league for any collegiate sport. In spite of their regular season performances, they did not see the same successes in their postseason run. The Spartans would fall at the hands of the University of Michigan Wolverines during the Big Ten tournament. The disappointment would not end there for Michigan State, as although they made another routine trip to the NCAA tournament, they failed to make it past the round of 32 after a massive upset loss to the Syracuse University Orange caused the Spartans to crash out of the tournament early. To make matters worse, Spartan forward Miles Bridges, the team leader in points per game, elected to declare for the 2018 NBA draft. Following the arrival of the commitment deadline for the class of 2018, Michigan State had picked up several four-star rated players, making the Spartans’ most recent recruitment cycle one of the best in the nation. Some of these top players included forwards Thomas Kithier, Gabe Brown and, most notably, Aaron Henry. This new collection of players would prove to live up to their label as the one of the most well assembled groups in the world of collegiate basketball, as Michigan State would repeat as Big Ten champions, earning themselves the No. 1 ranking heading into the postseason conference tournament. The Spartans would go on to dominate their league tournament, besting fellow top 10 nationally ranked program Michigan in the final 65-60. Michigan State opened up play in the 2019 NCAA tournament against No. 15 ranked Bradley University and converted all but one of 26 free throws to move on to the second round with ease. The Spartans met a conference rival in the University of Minnesota in the round of 32, decimating their opponent 70-50 en route to their first Sweet 16 in four years. Next up for the Spartans were the Louisiana State University Tigers, who held the No. 3 seed in the East Region, just one spot below Michigan State. The Spartans refused to give up their early lead to complete their second consecutive blowout, this time 80-63 over LSU, and secure their first appearance in the Elite Eight since 2015. The greatest victory that could have come the way of Michigan State was a win over media darling Duke which would deny the Blue Devils a chance at the Final Four, which was exactly what happened. History was against Coach Izzo, who had managed only a single win in 12 contests against Duke’s Mike Krzyzewski. In a back and forth battle, the Spartans would take the contest by a single point, destroying Duke’s air of invincibility. The Final Four would see Michigan State fall to Texas Tech 61-51, in a game that saw their offense almost completely shutdown. Despite the exit, the Spartans have shown extreme promise for the next season, evidenced by them keeping stalwarts Nick Ward, Xavier Tillman and Cassius Winston, holding on to future leaders Aaron Henry and Gabe Brown, and securing more top tier talent in Malik Hall and Julius Marble to give them the depth necessary to go all the way in 2020.